Joy and sadness overwhelmed Emelina Guerra when she first walked into a supermarket in Miami. It was full of food, a sight she hadn't seen in her home country, Venezuela, in at least five years. "I was very emotional because I realized my family was here and we finally had everything," says Guerra, choking back tears, as she recalled the moment. The sight made her grateful to be in the US but sad to think of her parents back home. Guerra, 32, fled Caracas just two months ago with her two-year old, Jesus, and husband, Miguel Arredondo, to escape Venezuela's soaring violence, political chaos and food shortages, along with concerns of political persecution. Guerra is considering applying for asylum, which she believes is her family's best option to stay in the US. 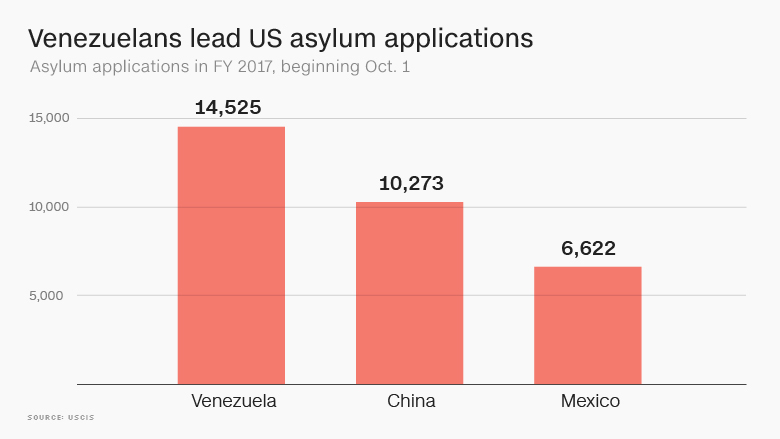 If she applies, she'll join an alarming trend: Venezuelans are now the top asylum seekers in the US, ahead of citizens from China, Mexico, Guatemala and El Salvador. It's the first time Venezuelans have topped the list. Miguel Arredondo, Emelina Guerra and their 2-year old son Jesus. They fled Venezuela in March and came to Miami. Guerra, a college grad, left behind a middle class job at a government budget communication office. She arrived in the US with a few bags, a couple of toys for Jesus, and some savings from selling their car in Caracas, which also helped pay for the flights to Miami. She and her husband are currently unemployed in Florida, unable to work until they obtain long term visas. They're on tourist visas for now. Over 14,700 Venezuelans sought asylum in the 2016 fiscal year, up 160% compared to 2015, when 5,605 Venezuelans applied for asylum. 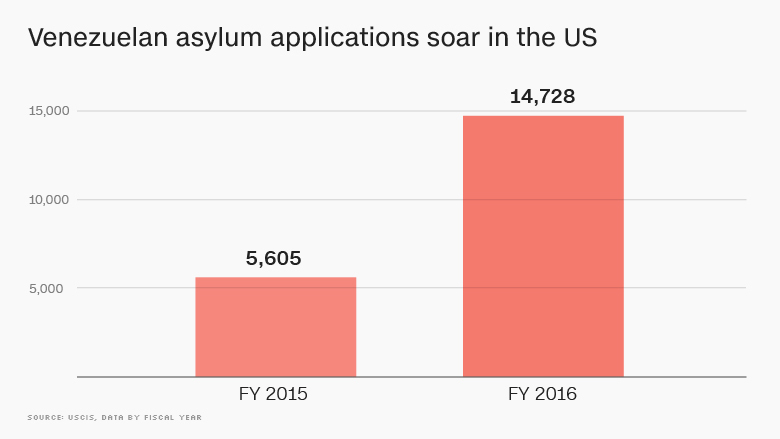 And just halfway into the current fiscal year, applications are on pace to double again and are well ahead of second-place China, according to data from US Citizenship and Immigration Services. One in every five applicants this fiscal year is Venezuelan. Patricia Andrade, who runs the volunteer organization Venezuela Awareness Foundation in Florida, has been overwhelmed by the wave of people arriving from the country. The organization gives out donated clothes, kitchenware and other essentials to new refugees from Venezuela. Andrade says in 2014 -- before the crisis severely worsened -- she would get an occasional call from a newly arrived family asking for help. Now she serves 30 families a week, all asking for anything she can provide. Last week, Andrade moved the donation center into a bigger storage space in Doral, Florida, to handle the rising numbers of Venezuelans who arrive with little but clothes and college degrees. Andrade helps provide the families with basics: dishes, clothes, towels, linens, utensils, pots and pans. "They never imagined that they could be in that situation asking for donations, for help," says Andrade, who moved to the US from Venezuela in the early 1980s to marry her husband who was studying here. "They needed to survive and that's why they left." Venezuelans are leaving a country that has quickly spiraled into chaos. As food and medicine shortages grow, protests against President Nicolas Maduro have stretched into a third month, resulting in nearly 50 deaths. A police tank recently rolled over a protestor and one man last weekend was burned alive during a protest. President Trump lamented the crisis last Thursday. "What's happening is really a disgrace to humanity," Trump said at the White House. Much of Venezuela's crisis stems from an unprecedented economic collapse. Unemployment is expected to reach 25% this year while inflation could skyrocket over 1,100%, according to the IMF. Facing those facts, Venezuelans are going anywhere but home. Besides the US, Venezuelans are also fleeing to Spain, Colombia, Brazil and Argentina, where the language barriers are few and entrance easier. According to Tomas Paez, an expert on migration at the Central University of Venezuela, nearly 2 million Venezuelans have left since 1999 when a socialist regime took power. Just like in the US, Europe and South America are also seeing huge spikes in Venezuelan refugees, supporting Paez's findings. By the time she left in March, Guerra was earning 98,000 bolivares a month, just above the minimum wage at the time and equal to about $26. She says workers in every state-owned entity were forced to attend political marches or risk their job. In Caracas, Guerra and her family often lived without milk, rice and other essentials due to the food shortages and skyrocketing prices. Guerra went to Andrade's donation center when she and Miguel arrived in Florida. 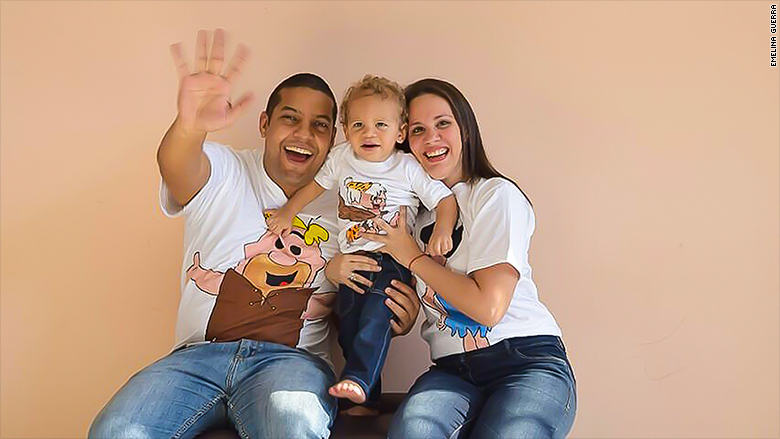 Andrade gave them clothes and toys for Jesus, her son, who is the main driver behind the couple's decision to leave Venezuela. The family lives with Miguel's brother and his family in Medley, Florida, right outside of Miami. It's a full house -- nine people under one roof including everyone's kids, a cousin and her husband. For now, Guerra is just happy and hopeful that her son will lead a better life, free of the violence in Caracas. She hopes to soon find affordable English courses so she can start a new life in the United States. "I can't imagine going back," she says.